Durable, non-lotion facial tissue provides the perfect combination of softness and strength. They make an excellent addition to any room in your home or office. Sturdy enough to hold up to everyday sneezes and touch-ups. 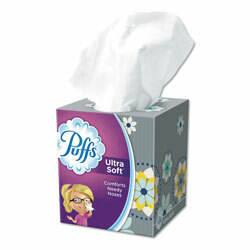 Puffs® facial tissues have Air-Fluffed™ pillows for a more cushiony feel. Tissue Type: Facial; Number of Plies: 2; Number of Sheets: 56 per cube; Length: 8 1/5". INNER PACKAGING: 24 Boxes. 56 Tissues Per Box. White Facial Tissue from Puffs! 1401 In Stock today.